It would be easy for Bridgeport Middle School teacher and Coach Robbie Buffington to feel like a victim. Buffington and the Braves, it seemed, were victims of circumstance. When a suitable option was found, it was all too perfect. 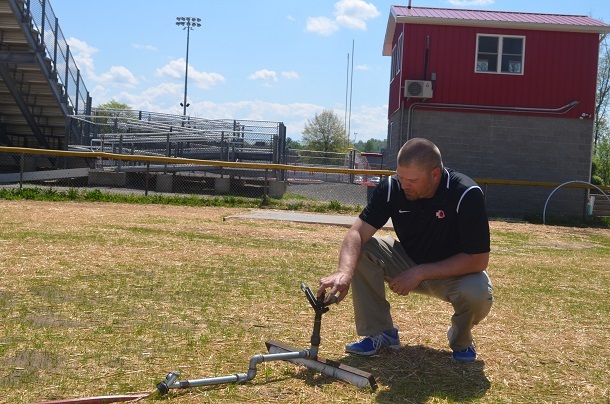 The former Little League field directly behind Wayne Jamison Field was available, but needed plenty of work in short order to get it ready in time for practice last August. The scenario was too perfect. Due to the JES build out, getting heavy equipment in and out to prep the field along with demolition and the contractors to do it wasn’t something that could be figured out overnight. This time, Buffington seemed to be a victim once again of circumstance. Yet it all worked out in 2017. Better than even Buffington could have imagined. “From a practice standpoint, I couldn’t have asked for a better resolution last year,” said Buffington. “Ideally, we would like our own field. Instead, we got a pretty good option of places. That promise appeared on pace to be kept. 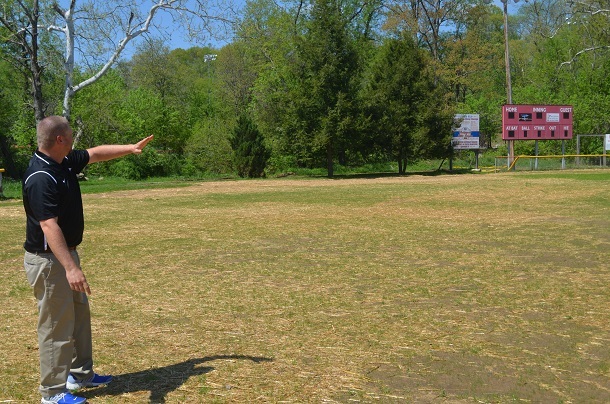 Portions of the old Little League field fence were removed, but more importantly the field itself had been tilled, seeded and covered with hay just last month. Finally, Buffington knew progress was at hand as the work in mid-April signified that he’d have plenty of time to get the field in decent shape to practice on. Then, the weather hit. Late on Sunday, April 15 and into the morning of Monday, April 16, West Virginia was ravaged with rainfall and flooding. Bridgeport and, unfortunately, the very field that had just been seeded and covered with hay was not spared. The process to start getting the field ready to be the new BMS practice field didn’t even last a week. Suddenly, Buffington was back to square one. “To see that was frustrating to say the least. It wasn’t anyone’s fault. It just happened,” said Buffington. Once again, Buffington could have felt like a victim. This time, a victim of Mother Nature. Recently, the same flood-drenched field was reseeded and covered with straw. On Wednesday of this week, large portions of the field were already sprouting grass. “That wasn’t here last week,” said Buffington of the grass when we drove to the field to inspect it Wednesday. The site made the coach and former BHS football three-time all-state selection smile. He was also happy because he knows along with his school, BMS and the Harrison County Board of Education others are ready to get involved. Having the youth teams involved is not just good for the practice field, it’s good for the Braves football program. Buffington was quick to point out that many of the youth teams in Bridgeport utilized the same practice field where the new Johnson Elementary School is nearing completion. Once everything is in order, Buffington said the field will be roughly 60 yards long. He said it will be the maximum width as well. “That’s plenty of field to practice on,” he said. Most notably is that the field isn’t just behind Wayne Jamison Field, but it’s a stone’s throw from the Braves’ own field house. “I’m certainly looking forward to walking out of the field house and onto the new practice field. We’ll definitely avoid using it if the weather is bad because we want the grass to take hold,” said Buffington. “After last year, I’m not even worried about that. I’m confident Coach Cole will work with us as is needed and you never pass up an opportunity to get on the turf.